The Mail as sent to Delivery Gains clients today and before that on September 29. Complete the intended quantity by buying at 118-125. Target Price 180-200 long term. Buy 30-50% quantity only at 105-110. Add slowly on every declines from 105-95. After buying initial quantity one can accumulate daily. Time Period : 6-12 months. The company is available at a market cap of 140 crores and a p/e of 10. 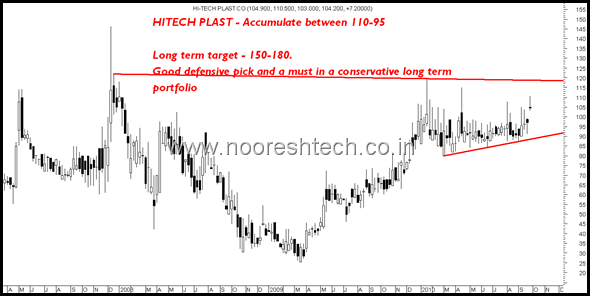 Hitech Plast is promoted by Ashwin Dani ( Asian Paints) and is one of the leading companies in rigid pakcaging with a pan India presence and has 12 plants. 50% of the revenues come from the Paints Industry and rest from home decor, chemicals,pesticides. With the current capex complete and the growth in the Paints industry we can expect good growth in the company in next 1-2 years. One can expect an eps of 14-16 in the next year. At current price and on dips till 95 there is a good margin of safety. A strong buy for long term investors with minimal downside. Technically stock has a strong resistance around the 115-118 mark which if crossed could give faster returns then expected.